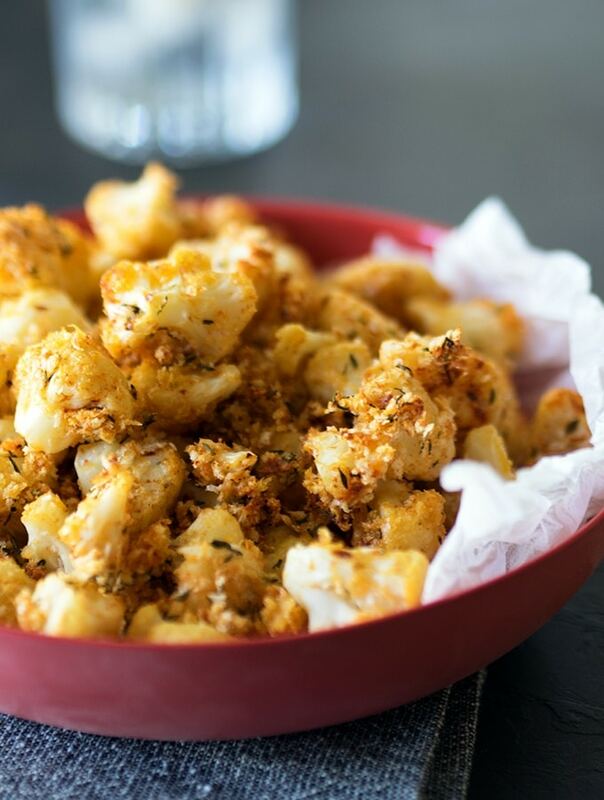 Oven baked popcorn cauliflower is a great vegetarian version to popular popcorn chicken. 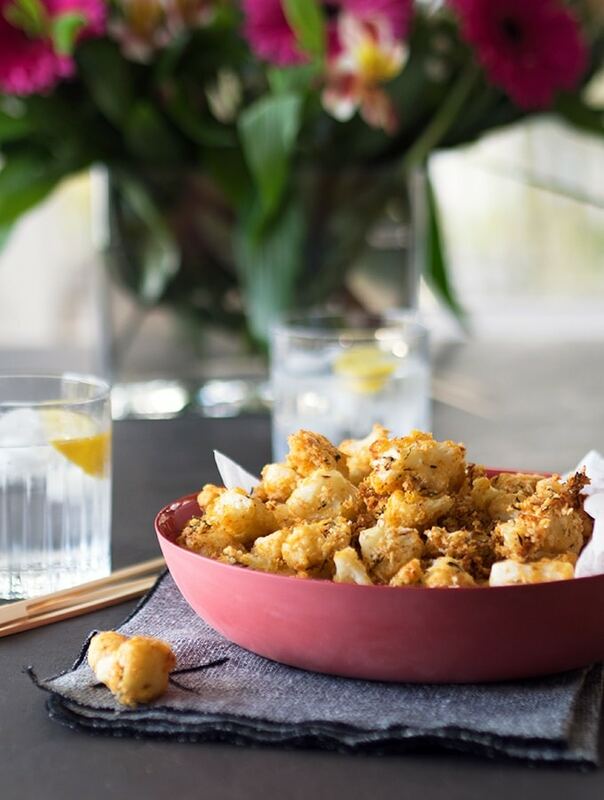 You will be popping these crunchy cauliflower florets into your mouth one after one. On the weekends I often get the craving for snacks. Especially if relaxing and taking time out to watch a movie or catch up on the latest series I am engrossed in. At the moment I am binge watching Lost in Space and getting my weekly fix of The Handmaid’s Tale and The Good Fight. You may have seen the gif in social media of Michael Jackson eating a bowl of popcorn (from the Thriller clip). It’s often used by an onlooker in a discussion thread when a heated argument or an “interesting” discussion is going on. That’s me with a bowl of this oven baked popcorn cauliflower while watching The Handmaid’s Tale! I go through a rollercoaster of emotions from disbelief, to worry, and then wanting to strangle a couple of the characters with my bare hands. I’m not a violent person in general, I promise. For a woman it’s a bloody scary story, and not impossible. Sadly parts of the story are a close reality for some women in some societies. But this post is not about television, the oppression of women or religion. No this is about tasty treats to stuff in your gob. These babies are great for serving to guests as well. Not just for stuffing in your face while watching television. It is a no fuss recipe that’s relatively easy to make. You can cook your cauliflower ahead of time and leave strained and cooling. Then 25 minutes before you want to serve, toss them in beaten egg and then the breadcrumb mixture. The oven baked popcorn cauliflower does need a couple of turns during cooking. Besides that, you don’t have to think about them. Between you and I, it won’t be a complete tragedy if you only give them a flip once, 15 minutes into the cooking time. None, simple and easy dish. I have thought about giving this recipe a go in an air fryer, if you do, let me know how you go. None, but don’t forgo the salt at the end, it needs it. Revenge may be a dish best served cold, but these best served straight from the oven and eaten. 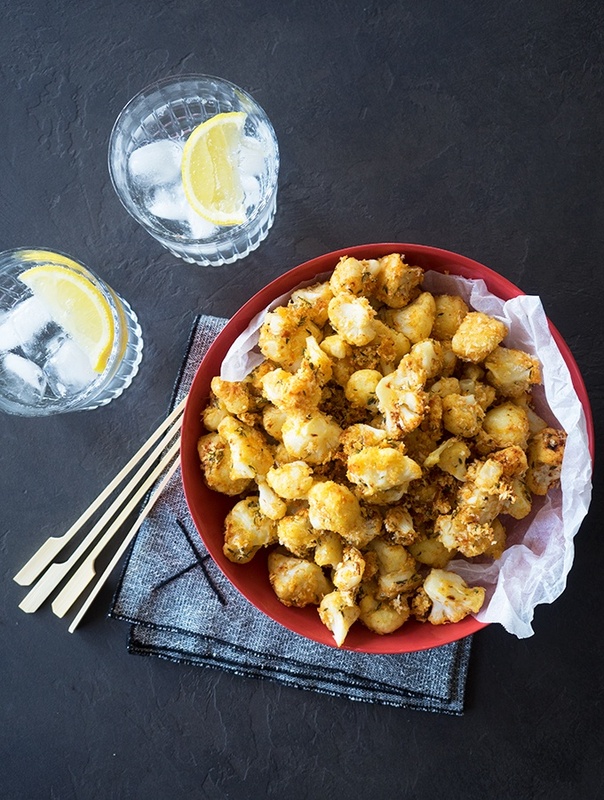 The oven baked popcorn cauliflower will lose its crunch on cooling. You can store any leftovers in the fridge for a day and then re-heat in the oven, but it won’t be the same. Preheat oven 210 deg C (410 deg F). Line a large baking tray with baking paper. Place cauliflower in a large pot with water. Bring pot to the boil and cook cauliflower for 5 minutes or until it is just tender. 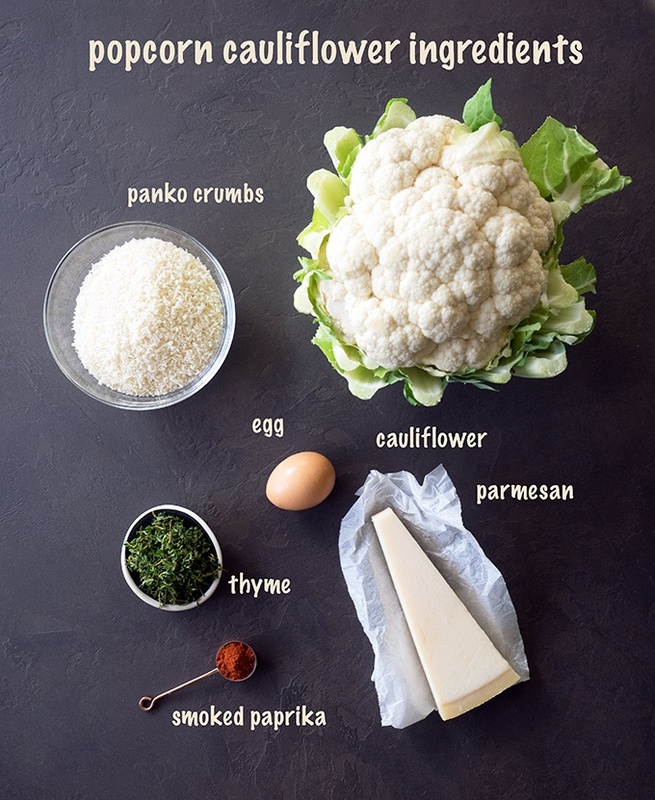 Drain cauliflower in a colander and leave to cool while preparing the rest of the ingredients. In a bowl combine breadcrumbs, parmesan cheese, paprika and thyme. Transfer cauliflower to a large bowl and mix through beaten egg. Add breadcrumb mixture to the cauliflower and egg. Mix well to coat the cauliflower florets. Place cauliflower on the lined baking tray and drizzle with a little olive oil. 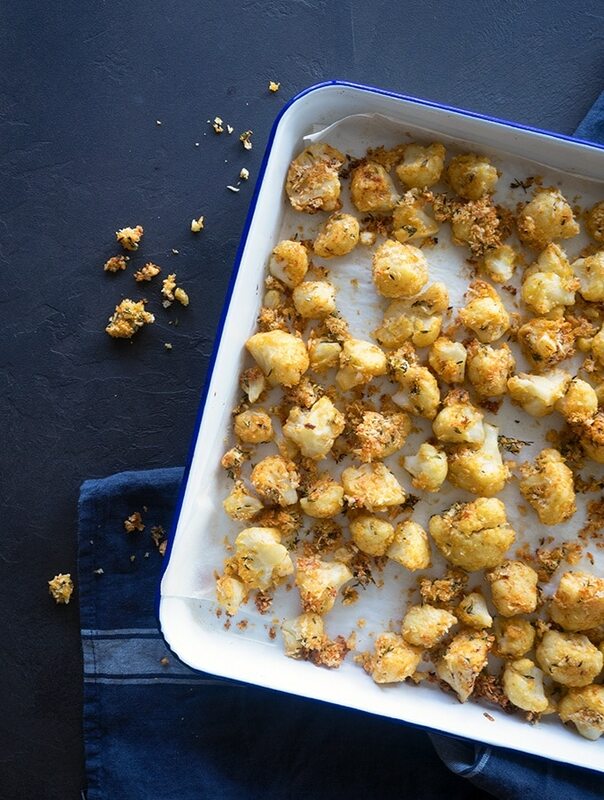 Place tray in the oven to bake for 25 minutes or until cauliflower is golden and crisp. Turn the cauliflower 2 or 3 times during baking to ensure they crisp up well. Place in a serving dish and sprinkle with a generous pink of sea salt to season. Serve immediately as it is best eaten when hot. This is an awesome idea, I love how delicious this looks! Thanks! This looks freaking delicious! 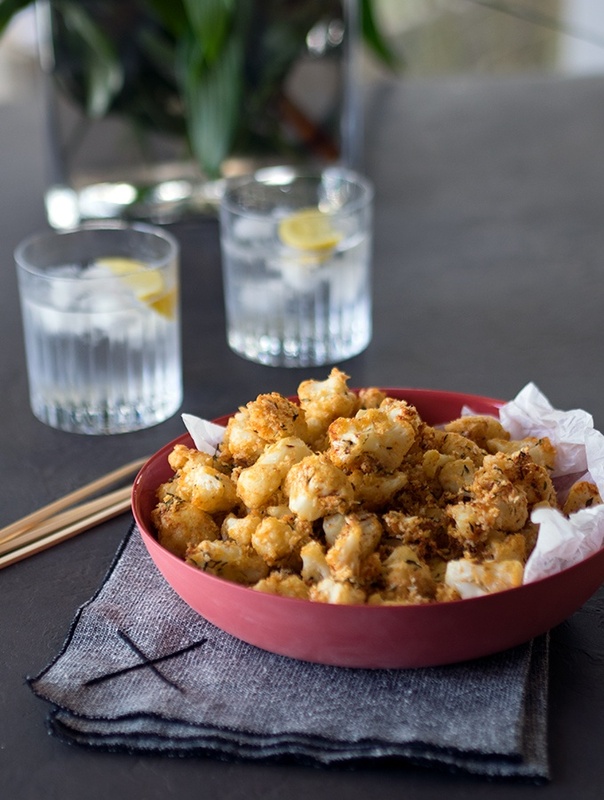 Might have to try making some cauliflower popcorns on the weekend!